Last week we discovered one of the most dangerous cases of DIY dodgy wiring we have ever come across. The client had an old ironing station in their house and when they removed the old station there was a cable that “looked funny”. What we found when we checked it out was that the cable had been wired up to have two male male ends. What that means is that the cable was 100% live as you can see by our magic tester. If you didn’t know that the cord was live, it would be easy to pick up the plug assuming the cord wasn’t plugged in.All it would take is for someone to accidentally touch a part of of the metal prongs and they would be dead in less than one heartbeat. The cabling is known in the industry by the terms suicide lead, suicide cable or even backfeed cords. Whatever their name they are deadly and should never be used in any home. 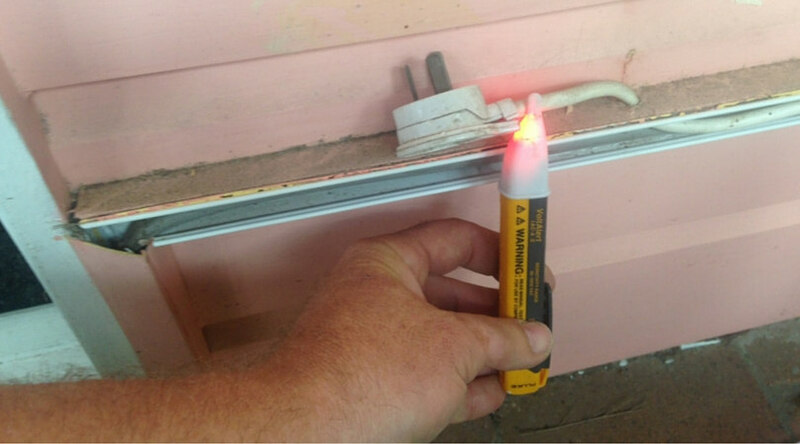 Electrical work is something that you should never DIY. Always call a licensed electrician to do any electrical work around your home and if anything looks a bit suspicious, give us a call and we will check it out for you. It is better being safe.